I locked my keys in my car. Can you “break” into it? Yes. However, professional locksmiths do not break into cars since ‘breaking in” indicates damage is done. Most locksmiths have 24-hour mobile emergency service just for this type of problem. They have the proper tools and, more importantly, the knowledge to open your car without damage. Consumers should be aware that attempts to open a locked car by anyone other than a locksmith could result in severe damage to the lock mechanism. A locksmith can also replace lost car keys from either the key code number or by hand-filing the key to the locks. l’m looking for an alarm system for my home. I’m wondering if you could suggest something for me. Yes. Your professional locksmith would survey your home and discuss your lifestyle before he would make any recommendations as to what kind of system would work best for you. Because there are many different brands and kinds of alarm systems on the market (from the discount house/chain store, do-it-yourself, one-plug models to the very sophisticated highly sensitive, call-the-police-when-it-goes-off hard-wired systems), you need to consult a professional locksmith to determine which is the best system for you. Only he has the expertise and the technical knowledge to advise you on how to achieve the best possible system for you for the least amount of money. I have an old skeleton key lock. I would like to get the locks changed. Can you do that? Unfortunately, no. The construction and operation of most of the old “bit key locks,” as they are called, are not, for the most part, rekeyable. Your professional locksmith can recommend an auxiliary lock that would give you the protection you seek, and when the need might arise, the lock could be easily rekeyed. My car keys were stolen. What can I do? Your professional locksmith can provide two options for this situation: (1) He can replace the keys to your car by either making keys by the code number or by hand-fitting a key to the lock, or (2) For the best protection, rekeying the locks to new keys would recommended. By rekeying the locks, you have the only keys that fit your car. I would like to have some locks installed, but I don’t know if the door is in good enough shape to have this work done. Should I find a carpenter to fix the door before I put new locks on it? No. Your professional locksmith usually can repair most problems with ordinary doors by adding new hardware, hinges, closers, locks, and/or strike plates. He also can solve the problem of sagging doors and ill-fitting strike plates so that the door will fit smoothly and the lock and strike plate will function properly. I’ve seen the word “ALOA” on a couple of locksmiths’ Yellow Pages ads. What does “ALOA” mean? ALOA. It’s not Hawaiian for ‘Hello” or ‘Goodbye,” but it stands for the Associated Locksmiths of America, Inc. (ALOA). ALOA is a trade association of qualified, ethical, professional locksmiths who are actively engaged in supplying, servicing or installing locks, keys and all related lines of the security industry. ALOA assures you as a consumer that you are dealing with a professional locksmith, a dedicated individual who not only has the educational and technical competence, but a real desire to provide the right security for you and your property. So how do you know that you are dealing with an ALOA member? First, look in the Yellow Pages for the locksmith who uses the ALOA symbol. Every ALOA member carries an ALOA identification card to show proof of his or her qualifications. Many members have taken the time to study special-interest areas, such as safes, automotive security, or other areas. After passing a test, this member is designated as a Certified Registered Locksmith (CRL), a Certified Professional Locksmith (CPL), or a Certified Master Locksmith (CML). The following is a partial list of the many services available. Keys Duplicated, Lost Keys Replaced, Master Key Systems, Locks Changed, Locks Installed, Locks Replaced, Deadbolts, Window Locks, Window Bars, Cars Unlocked, Lost Car Keys Replaced, Homes and offices Unlocked, Safes Sold and Serviced, Combinations Changed, Safes Opened, Burglar Alarms for Homes, Businesses and Autos, Card, Keypad. Push Button, Mechanical or Electronic Access Systems. Not all locksmith companies offer all of these services, and some may actually specialize in only one or two areas. How can I choose the right locksmith company when I need service? Most locksmiths advertise in the Yellow Pages. Look for one close to you or one who clearly indicates he offers the services that you need. Check the ad to see if it indicates membership in a locksmith association such as the Associated Locksmiths of America, Inc. (ALOA). Membership in an association is not a guarantee of satisfaction. However, only the most conscientious businessperson takes the trouble to join a professional trade association. I just bought a $600 mountain bike. I need to lock it up and I was wondering what you would recommend. Your professional locksmith has many padlocks from which to choose. A locksmith will probably steer you away from the poorly-made locks that are fairly good imitations of the better locks on the market, yet are cheaply manufactured but offer little or no security. There are many bike locks on the market. Some offer features such as being large enough to lock the wheels and frame to a fairly large diameter post such as a parking meter, or chains or coiled cables that you string through the wheels and frame before you lock the padlock. You must determine whether weight will be a factor, since a heavy lock might be too much weight to carry when traveling very far. You should discuss all of these factors with your professional locksmith before you make any decision. I found a deadbolt at a chain store for $9.95. Your deadbolt costs $25. What is the difference? Your professional locksmith has one advantage (in today’s ever-competitive market place) over the rest of the retailers that are selling the same type of merchandise. That advantage is knowledge. The chain stores are in business to sell only. They do not have extensive knowledge about the product, its deficiencies or how to properly install it. If you have a question about a product, you more than likely won t be able to call the chain store where you bought it for service, because they have no knowledgeable person on staff to discuss your problem. However, they will gladly take it back and replace it, or refer you to the manufacturer for help. The product your professional locksmith sells is the highest quality for your money. He can tell you the advantages of the products he sells, and steer you clear of a bad choice that you will ultimately regret. 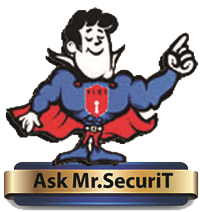 He has the knowledge to sell, install and service the security products that you might need or want. He places his reputation on the line with each and every product he sells. He wants you, his customer, to feel secure and to be happy with your purchase. I have a key with a number on it. Can you make another key using only the number as reference? Your professional locksmith can make almost any key from a code number. However, if a duplicate key is what you really want, it is much less expensive to take your key to the locksmith and have him Copy it. If you need a key by code, however, first determine if the number on the key is a key blank number or a true code number. Many manufacturers put numbers on original factory cut keys that are supplied with new locks. Most of the time these numbers indicate what cuts the keys are. Also, many manufacturers produce after-market key blanks in many different keyways that have coding numbers that only indicate what brand of lock the key blank will fit, not what the cuts of the key are. A number of foreign cars are supplied with code numbers stamped on the original keys or on a tab with the code number attached to the original keys with a ring. Copies of the original keys never have code information on them unless if was stamped on the key by a locksmith. Most domestic cars have code numbers supplied with the original keys, but rarely are numbers supplied on duplicate keys. Your professional locksmith can “read” your key and supply you with information for future reference. With this information, the locksmith can produce a code key for you. The keys I’ve had made at the hardware/discount store either don’t go in or when they do go in, they won’t open the lock. Can you make a key that works? Yes. Your local locksmith store is always the best source for keys that work the first time. A trained locksmith can quickly identify the key you need and make it using only the best materials and equipment available. A locksmith can make almost any kind of key: luggage keys, car keys, foreign auto keys, motorcycle keys, and home and office keys, to name a few. I just bought a new house. Is it a good idea to get the locks changed? Absolutely, yes! You have no idea how many keys are in the hands of strangers. Neighbors, real estate agents, and even the builder may have keys. A locksmith can rekey your existing lock so that the new key is the only key that will open your door. At the same time, a locksmith can recommend extra security measures, such as deadbolt locks, window locks, and sliding door locks. Some locksmiths even offer security bars and burglar alarms as part of their service. I have a deadbolt that worked fine when I locked it this morning. But now when I put my key in, the key just spins around and the door is still locked. Can you help me? Yes. Your professional locksmith can get you in. Sometimes it can be done without damaging the lock, but if the lock must be sacrificed, he usually will be able to replace it on the spot, keying it back to your original key. Then he will attempt to discover what caused the lock to break. if the lock was not installed correctly, he may have to make adjustments to either the lock and or the strike plate on the door jamb to correct the problem. Be assured that he will do his utmost to solve the problem so you wont have another lockout. Locks on a house only keep the honest people out. You can’t really secure my place, now can you? A professional locksmith has the knowledge to provide enough security to make your residence or business as secure as Fort Knox. It only takes enough money and the right combinations of high security locks, access control devices and alarm devices. He can provide retina-matching or fingerprint-matching devices to operate the access control system that will allow you to use a key which can’t be duplicated. This will enable you to unlock the interlockng deadbolt which allows you to gain access to the keypad to disarm your internal and external alarms so you can get into the house. Then, once you are inside, you can re-arm all the internal, external and perimeter alarms, trip wires and land mines, so you will know when someone is trying to get in. Now, for some people and organizations this might be exactly what they need, but is this the way the average homeowner wants to live? Your professional locksmith can guide you to the best security that money can buy, and at the same time, recommend a security system that is practical. I have a beautiful 150-year-old house with very ornate doors. I have the old-style skeleton key for the front and back doors. I have been to every hardware store in town and they can’t duplicate them. Can you make them? Yes. Most locksmiths have the equipment to duplicate these types of keys. However, you will find that a good locksmith will caution you on the use of those locks as the primary way of securing your house. The old ‘bit key locks,” as they are called, are not very secure because the construction and operation of most of the bit key locks around today do not lend themselves to large numbers of key patterns. At most, only 250 different bit key patterns are common today throughout the country, and many of the bit key locks on structures can be unlocked with a universal pass key which is shaped to open many different bit key locks. Your professional locksmith can recommend a good auxiliary lock for the ornate doors that not only will blend in with your existing hardware, but at the same time will give you an excellent upgrade of your security. I have five locks on my house with five different keys. I would like them changed and keyed alike. Is that possible? Yes. Your professional locksmith can key locks alike if they are the same manufacturer’s brand. if they are not the same brand, there is a possibility that they may still be keyed alike if a key blank can be found that will enter into all the locks. It is not the best way to accomplish the task, but it will sometimes work. The proper way is to replace the one or two locks that are not the same and then use the original manufacturer’s key blanks in the lock. What features should I look for when choosing a good deadbolt for my home? There are many good quality locks on the market and your professional locksmith is your best source for advice on the right one for you. A good deadbolt lock should be a tubular design with at least a one nch throw locking bolt. It should also have a tapered outside collar to resist wrenching, a high security strike plate to reinforce the door frame and at least two 1/4 inch hardened steel bolts to securely fasten the lock to the door. Proper installation should be done by your professional locksmith so that you will get the greatest measure of protection from any locking device. As a business owner, I’m concerned about the number of keys that have been given out over the last few years. What should I do? Your professional locksmith can offer several options at varying prices. First, you might consider rekeying the existing locks to new keys and then keep track of the keys you give out. Second, you might install high security keys and locks so that you will have much more positive key control than you had with your existing locks. Third, you might consider installing a keyless access control system requiring no keys. Each employee would have a unique number that would allow them access. The keys to my laundromat were recently stolen. They are those funny round keys. Can you make me some new ones? Yes. Your professional locksmith can furnish you with new tubular keys for your laundromat even without being supplied an original key. But he would also recommend that, in addition to having the exterior doors rekeyed, the locks on your machines should be rekeyed also. This would prevent the thief from returning and emptying the machines at his leisure. I have a problem with the lock on my business. It is one of those aluminum glass doors. The inside lock works fine, but the outside lock doesn’t work right. I am considering replacing the lock. What should I do? Your professional locksmith can help you solve this problem with a minimum of expense. To replace the whole lock would be expensive and totally unnecessary in the majority of cases. These types of locks require periodic lubrication of specific parts of the inner lock mechanism for smooth operation. However, most locksmiths will recommend that all locks (car, house, business, padlocks or any lock subjected to any type of weathering) be cleaned, serviced and lubricated on an annual basis. Because most locks are constructed of metal parts that rub against other metal parts, without lubrication these parts can bind, causing poor operation, frustration and in extreme cases, a total lockout. You should service your vehicle regularly to keep it operating smoothly and without breakdown. The same should be done to your locks. Unfortunately, as the television ad says, You can pay me now or pay me later. The back door to my business has a crash bar on it. I am afraid that customers could get out that way without anyone noticing. Can I put a deadbolt on the door to keep it locked? Your professional locksmith is knowledgeable about fire and building code requirements that are in effect in the area you are located. Your professional locksmith can recommend what type of device would be best for securing the door and, at the same time, keep your building within the compliance of fire or building codes. I have a business with about 25 doors. Different employees need access to different areas, but I do not want all employees to have access to all areas. What should I do? Your professional locksmith will discuss with you the parameters of your business, what kind of access you want your employees to have, and how much you want to spend on the job. If the job is simple and a minimum of security is involved, he may recommend a master key system that would accomplish your objective. If more security is required, then he may recommend a master key system coupled with high security locks and keys. If more sophistication is needed, an electronic access control system with a computer to record dates, times and the employee number using the door may be recommended. Your professional locksmith can offer all of these options for your business along with installation and service contracts to back them up. He will provide a security system that works for you. My business just hired two people who are wheelchair-bound. I need “handicap accessible” front and back doors. Who should I go to? Your professional locksmith should be able to provide you with information on barrier-free design and handicap access hardware to accomplish what you want. He has access to automatic door closers and access systems that are designed specifically to meet local and federal handicap-accessible” regulations. One of our maid’s hotel master keys has been stolen. It opens about 40 rooms on the third floor. We’re wondering if we have to go to the factory and order new locks and keys, or can you help us? A professional locksmith can solve this problem for you usually within a day or two. One of the questions your locksmith will ask you is if you have any keying records that either came from the factory when the system was originally installed or from the last time the hotel was rekeyed. If you have these records, it is a simple matter for your locksmith to expand the system, cut the keys, and rekey the locks. If you can’t find or never had any keying records, your locksmith can determine, from the keys you presently have, what the master keying system is. Then he can expand that system to cover the additional changes you need, cut keys, and rekey the locks. Usually the whole process can be accomplished within a day or two. After the new system is installed, he will be able to provide you with a updated keying list for your records for future reference. Your professional locksmith will be able to solve your immediate and long-term problems for the master key system for your motel. I want to buy a safe to keep my valuable coin collection, my Krugerrands, my tax records, my stocks, all the titles to my cars, all my important papers, 100 floppy disks containing my new manuscript, 10,000 negatives for my book and all my wife’s diamond jewelry. What do you have that I can put it in? Unfortunately, there is not a ‘one stop – one size fits all” solution to this question. Your professional locksmith knows that each type of safe (fire-resistant, burglary-resistant, data,) is built to different specifications for the various types of materials to be stored inside. Because your stocks, important papers, tax records, deeds and titles are of little monetary value to a thief and, therefore, need little theft protection, your biggest concern should be for fire protection. On the other hand, because your valuable coin collection, your Krugerrands, and your wife’s jewelry are at a greater risk of theft than being consumed by fire, you should consider theft protection as the most important security need. Lastly, your manuscript on those 100 floppy disks and the negatives for your pictures need special protection. With the proliferation of personal computers and magnetic media that all data is stored on, safe manufacturers have found that record sates that have adequately stored written materials for years do not adequately protect the magnetic storage media of today. Most safes are rated to an internal temperature of 350 degrees for one hour, a temperature that would destroy magnetic media. After much testing, it was determined that magnetic media should not be subjected to temperatures above 125 degrees Fahrenheit. Therefore, if you want to protect all your valuables you will probably have to either make trade-offs as to which is the most important risk that you might be facing, or purchase three types of safes. My business was broken into last night. The burglars broke the dial and handle off my safe and now I can’t get into it. Can you open it for me? Yes. Most professional locksmiths have the knowledge and the tools to successfully open almost any safe. Sometimes, depending upon the safe and the amount of damage done, the opening is fairly easy and repairs can be done on the spot. Other times, the opening can involve considerable time and expense; after it is open, the repairs could be cost-prohibitive and the safe may have to be scrapped. Your professional locksmith should be able to size up the work before him and give you all the details of what has to be done and what the cost will be. I have a safe and was able to open it with no problem for years. I’ve dialed it for about an hour and can’t get it open. Can you help? Yes. Most professional locksmiths have the knowledge and expertise to solve your safe problems. Usually, from the information that you give over the phone, he should be able to help you. If it has been some time since you have had the combination changed or the safe serviced, then it might be a minor problem that he can solve easily. He would service the safe to prevent the problem from reoccurring. Most safe manufacturers recommend (depending upon the frequency of use) that the inner mechanisms of their safes be serviced by a professional locksmith at least once a year to maintain smooth operation. Most professional locksmiths have safe maintenance programs to keep your safe in top condition. I’m considering purchasing a safe for my home. Where should I go to buy one: an office supply store, hardware store/discount store, or a locksmith? Although many stores may sell safes, very rarely do their personnel have the level of expertise of most locksmiths. Not only is buying the right safe important, but servicing it also should be a primary concern of the customer. Buy from a source that can meet all your needs. Select a locksmith who sells and services safes.